“Riders!” Nicholas Zerkle called down to Johan from his perch by the gates. “Who?” Johan called up. Suzanne had begun her laboring and now they had arrivals. He rubbed the ache in his temple. “Militia.” The shout of militia circulated around the fort, accompanied by the sound of moccasins and shoes skimming over packed dirt. Finally—Colonel Christy’s request had been answered. Johan gazed around at this varied group that somehow he’d been asked to commandeer. Dear God please have sent some real help, provisions, and some good news. A contingent of men, perhaps thirty total, brought their horses to a halt just outside Fort Providence. Their leader, an aristocratic-looking man but dressed in Virginia militia clothing dismounted and headed into the fort—Wyatt Scott, their old friend from New Kent. The men remained outside. Perhaps a good sign—if they were pursued they’d come in. Or were they on their way? Christy pulled Wyatt into a brief embrace. The militia officer rubbed his chin. He turned toward Johan, his eyes widening. “Suzanne invited me to celebrate a French-style Christmas sometime, you know—elsewise I’d not be here.” He chuckled then turned and motioned for the men to begin carrying in boxes of provisions. “Ja, I think you are confused. I think you just wanted to be here for the new baby, Wyatt?” Johan clapped the militia lieutenant on his shoulder. Johan’s older kinder rushed toward them and wrapped their arms around Wyatt’s legs. He hugged the oldest two and lifted the younger, one in each arm. “Mama’s having a baby.” Adam squared his broad shoulders. Only seven, his height made him appear much older—how long till he looked like the young militia men outside the gates? Suddenly Johan’s limbs were empty as the others clambered toward their brother. He caught a whiff of the spicy dark chocolate and his mouth watered. He’d not seen chocolate like that since he’d been to Williamsburg a year earlier. A chill breeze gusted across the yard, chasing the children toward the cabin. A muscle in Christy’s jaw twitched. “Have you provisions for all of us?” He raised his chocolate bar. He couldn’t resist any longer—Johan unwrapped the thick bar and took one bite, savoring the taste until Nicholas Zerkle scowled at him. Wyatt Scott fixed his gaze on the man. “If you wish to receive your own, I suggest you get back to work.” He held Nicholas’s gaze until the younger man stalked off outside toward the militia. “Which we’ll be happy to provide—once they’ve had a little rest.” His glance veered toward the large central building within the compound. The minister emerged from the barracks building. Earlier it had been swept clean and was now being decorated with trinkets the ladies had gathered. Although the pastor moved slowly, he had survived his severe case of flux that hit just after his arrival. The young couple who were to marry that evening had been separated so that the ladies might prepare the bride as best they could. And the Baptists had announced that although they would attend the wedding they would not dance afterward. Suzanne came out of their cabin, Sarah at her side, as the children pushed past them, inside. “Indeed.” Wyatt rubbed his chin and turned to look through the open gate at the men tending their horses. Boxes and crates were being brought in and stacked in the center of the yard. People began to gather around them and carry them toward the barracks. When his wife placed her hand on her swollen abdomen and gasped, Johan moved toward her. She’d overdone her preparations for the French Christmas celebratory feast for that night after the wedding and dance. Sarah, eyes wide, placed a hand under Suzanne’s arm and lowered her onto a bench. Johan ran to her and spied the ground beneath his wife’s tiny feet darkening with the baby’s fluid. Tears filled his beautiful wife’s eyes. Ja, the baby would come soon. Here, in this place. Walking beside her dah, her arm curled through the crook of his arm, Allison Cameron gave her attention to the lace dripping from the elbows of her wedding dress. Her sister, Katherine, had tatted the lace that had adorned her own bridal gown. 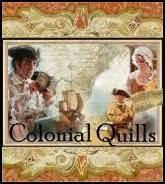 Allison’s quilted petticoats rustled underneath her finely hetcheled linen skirt that billowed around her legs like a pale blue cloud. Overcome by an awkward shyness, she dropped her gaze to the toes of her boots, one of which held a silver sixpence for good luck. Drawn by an irresistible urge, she lifted her chin and stared straight into her groom’s eyes. Blue like flax flowers in summer, they studied her with powerful emotions -- adoration, pride, and desire – stirring sensations that whirred in her stomach like a spinning wheel. How handsome he looked in his chocolate brown waistcoat, crisp white shirt, buff breeches, and shiny black boots. His dark auburn hair usually free flowing around his shoulders was secured in a brown bow. The clan McCallum sash, its green and muti-hued blue stripes that reflected the color of his eyes, draped across his chest. In the few weeks they had known each other as passenger and wagon master, Allison had never seen her husband-to-be in anything but buckskins and moccasin leggings. This new Douglas took her by surprise. Her heart thrummed, and she barely felt her feet touching the ground. She caressed his cheek and swallowed the lump in her throat. She looked up at Douglas, who must have heard the exchange for his Adam’s apple bobbed beneath his superbly tied cravat. Her pulse fluttering in her ears like the pedals of her spinning wheel, she barely registered the pastor’s words, and made her proper responses in a daze, until Douglas gripped her fingers. “It’s time, dearest,” he prompted. His family. His treasure. Her heart leapt. Suddenly they were surrounded by revelers, their fellow refugees who had sought shelter at Fort Providence. All seemed ecstatic for a short respite from the dangers lurking outside the fort’s walls. They began clapping, shouting, hugging, laughing, and, much to her chagrin, pulling her apart from her husband. Her mah, her eyes misty with unshed tears, asked her to lean down so she could kiss her on both cheeks. Loud peals of laughter tumbled from the tiny woman as she pulled Allison across the room to Katherine, who, still recovering from a near death bout with fever, sat in a chair, holding her one-year-old son in her lap. Allison kept craning her neck, trying to spot Douglas, who was doing the same thing while good-naturedly bracing himself against the slaps on his back. She caught his eye and they laughed when she found herself surrounded by the ladies who oohed and ahhed over her dress. When finally the laughter died down, the crowd escorted Allison and Douglas to a table where they sat together and marveled at the bounty laid before them, venison swimming in gravy, succulent rabbit stew, cinnamon sweet potatoes, dumplings, vibrant green snap peas, walnuts, baked pumpkin, and rhubarb pie. His words and the longing in his eyes wiped away her appetite, and she could feel her eyes growing wide. She took the morsel in her mouth, chewed, and swallowed, all without taking her eyes from his. When he reached across to her plate and cut the venison for her, she wondered what his tan, scarred hands would feel like on her person. She took a sip of ale and nearly choked when he drew his thumb across her lips to catch a stray drop of the fiery liquid. He scanned the room and joined Colonel Christy and his son, William, at the far end of the room where they chatted with the newly arrived militia captain. The oldest Zerkle sibling stepped from the crowd and adjusted a fiddle under his chin. One of the soldiers pulled a fife from his pocket, and another man dressed in buckskins sat on a chair and began to pluck a dulcimer. The men and women opened up a circle and stared with anticipation at the newlyweds as the musicians sought out a tune that Allison recognized as Eriskay Love Lilt. On the makeshift dance floor, her husband – what a lovely sound – surprised her once again by leading her through a slow reel with grace that belied his large frame. The others joined in, some dancing and some singing. Allison made her way to the door where her mother and father greeted her with such happy faces she wanted to shout for joy. Douglas helped her with her cloak, taking the piece of dried heather from her curls and tucking it into his shirt. “Ha! I see they are making their escape,” yelled one of the men. Some of the men guffawed. “Oh!” Mortified, Allison threw her hands up to her face and dropped her head against Douglas’ chest. Allison uncovered her eyes and dropped down on one knee to receive the good luck charm from the young orphan who had recently lost his parents in an Indian attack. Her heart had gone out to him the moment they met. “Thank you, lad.” She rumpled his thick hair the color of corn silk and he smiled at her, his bright blue eyes sparkling. When she stood, Douglas glanced from her face, to the boy, and back again. “’Tis another thought we have in common, my dear. We shall talk of it later. But now….” He swept her up into his arms to the delight of the ladies present. She laughed and snuggled her face into his neck. Yes, away to a new life, a new adventure. She could not wait to see what life had in store. A look of relief mixed with parental love flooded the father’s face. Comfort smiled as her own tears welled. Such love! Would Jonathan look like that when he beheld their child? Her husband’s arms enveloped her waist as he led her towards the door. He lifted a cloak from a hook, wrapped it around Comfort, and gently drew her outside. The light snow barely announced its presence as it danced, then found its home on the wool before melting into the warmth of the material. The look on her husband’s face brought a shiver of delight, far warmer than the cloak. “I was so worried about you. You’ve not been well.” Jonathan touched her cheek with tenderness. Tears brimmed Jonathan’s eyes. “Our own child?” His face contorted and trails of salty tears blended with the melting snowflakes on Comfort’s cloak. Comfort bit her lip. “Are you distraught, Jon?” She fought the moisture that welled in her own eyes. Suzanne sucked in a shaky breath—the night had been long, but Comfort had proven capable and competent in assisting Sarah in the delivery of her first daughter and seventh child. “Noela—I wish to name her Noela, Johan.” Suzanne released their precious daughter to her husband, his face tender, awed. How she loved him, he'd truly journeyed through so much with her. “She is really a girl? Ja? You are sure?” He began to unwrap her. “Noela Marie.” She squeezed his hand, so warm and sure. “A daughter, after all those boys—I cannot believe it. I would not allow myself to hope for a girl this time.” Tears slipped down her cheeks. He pressed a gentle kiss to Noela’s little cheek. She was so tiny and perfect. Tiny rosebud lips began to move. She’d want to eat soon. Suzanne sighed. “We missed the wedding. I love weddings.” And the bride would surely have been radiant. The Ingersoll men appeared stunned. “After six sons?” They cast a speculative glance in her direction. “Congratulations. We’ve brought her a present.” Nathaniel and Jonathan Ingersoll carried in the cradle they’d crafted for the baby. “May I see?” Suzanne had viewed the cradle earlier in the week but not the piece had been completed. The men brought it closer. On the head and foot board, Nathaniel had carved a cherub, his workmanship superb—Suzanne had seen the work of master craftsman at Versailles whose work paled in comparison. Suzanne raised her head and could make out the faint outline of Rousch in white work thread. Constance’s work was excellent. She smiled. “Tell him Noela thanks him.” Reaching for her daughter, she caught the hesitation on Johan’s face. When the baby began rooting around on his shoulder though, he handed her back. “Gentleman, I think we go now to assist with the Christmas feast and bring Suzanne back a nice plateful, ja?” Johan clapped an arm around each man’s shoulder and steered them toward the door. Giveaway: Susan Craft is giving away a copy of her beautiful book "The Chamomile" to one reader. This made my 2011 Top Ten Favorites on my personal blog Overcoming With God. Amish Snow by Kelly Long. Wow, that was a lot to process! You ladies did an excellent job with this part of the anthology. A wedding and a birth! It was nice hearing the name Carter again, Carrie, even if it was a brief part. I truly enjoyed the wedding vows and the banter that took place afterward was so funny. Have a Merry Christmas ladies and God bless!!! Yes, this one was twice as long as the others but I wanted to get Susan's wonderful wedding story in! The real life Suzanne had a son inside a fort according to some stuff I have read. But then again, this is a fiction! MERRY CHRISTMAS!!!! Thanks, Debbie!!! I got my baby girl first and I was praying for a daughter. God blessed me. Then almost 13 years wait for our boy that He promised me!!! Wonderful! just beautiful, ladies. I knew you'd have something special for today. I love this series and, okay... I cried at the wedding and birth. What a treat this has been. Ohhhhh, I am so glad you liked it, Deb!!! MERRY CHRISTMAS!!! Oh yes, so lovely. I see it like I'm watching a mini-series and I want to know more and spend more time with everyone. I need to catch up on all your books as well. I just received Deer Run last week and looking forward to starting it. Thank you all for your generous and caring spirits. What an enjoyable place to hang out online! Deb, a number of people have told us that--thank you!!! We are ready for you to be a CQ contributor whenever you're in the mood! Love all our CACW members and so glad you got to come down to CW last year!!! Carrie, my niece's name is Noelle! (in fact it is Noelle Valentina - her mother and father are both very talented, artistic, creative people). Ladies I loved the wedding and the birthing. :) New beginnings, both of them...such a perfect way to celebrate Christmas. Lynn, Did you see that I got in the part about the Baptists not dancing? What a pretty name your niece has! So glad you enjoyed this, Lynn, and thanks for participating in the anthology! Good, glad you saw that!!! Glad you like it, Kay! Thanks for coming by and MERRY CHRISTMAS!!! It's so wonderful how it all fits together. Thank you Carrie, for making this happen. It was such fun being a part of this. I just love that you give Suzanne a girl after having six boys. As much as you enjoy the Shirley Plantation, I am happy to see that you wove it, the chocolate, and provisions into the story. And Lynn is right, new beginnings -- that's a perfect way to celebrate Christmas. Thanks so much for the beautiful wedding scene, Susan, and I am so glad you like the rest, too! 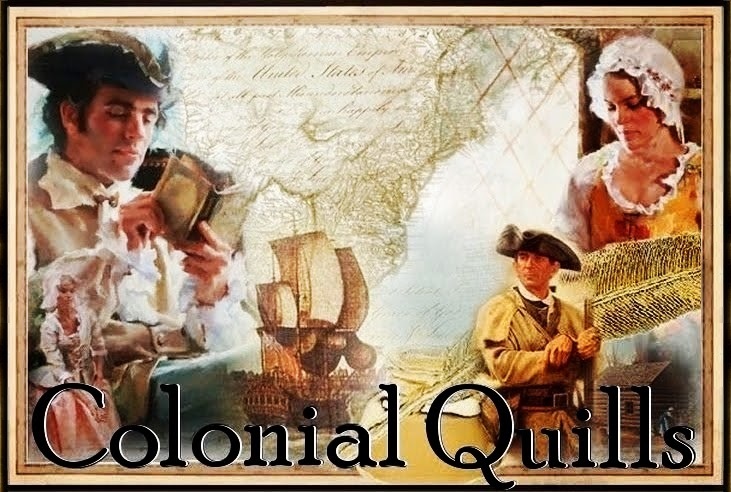 So glad we could give our colonial friends in story world a happy Christmas and our followers a nice story, too! MERRY CHRISTMAS!!! Thanks so much, Janet. MERRY CHRISTMAS!!! Thanks, Diana, and so glad your internet is working again! Praying you are all better soon! What a beautiful addition to this wonderful story to read on Christmas morning! Thank you all! And Carrie, what a lovely name for their first baby girl!! :) Happy Christmas to you all!! Just back from Christmas service at a parish that my ancestors attended during colonial times!!! I thought this name was a great idea! We are SO glad to have you with us over at Overcoming With God!!! You ladies did a GREAT job! Sweet and appropriate for Christmas Eve. So glad I had the joy of going to a wedding and meeting little Noela too. What a delightful gift--thanks Carrie, Susan and Elaine! So happy that you enjoyed it, Pat. Pat, this was fun. It got so long I couldn't really add any more information to it from our other characters but I suspect yours and Kathy's will reappear for the finale!!! Veronica, thank you! We are very grateful Susan is giving away a copy of her wonderful book! Merry Christmas! MERRY CHRISTMAS TO ALL! And a special announcement for Veronica Sternberg -- you are the winner of a copy of The Chamomile. Congratulations! I'll be in touch and get the copy to you right away. Merry Christmas! I am awestruck at how lovely the story has been. You ladies made a beautiful ending. It has been such a gift reading this. Thanks again! Kathy, thanks so much for your contribution! 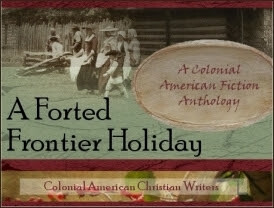 This has been fun and so great working together on this Forted Frontier fiction! Hope everyone had a fabulous day yesterday making merry! Wonderful ending to a wonderful story! This has been so enjoyable and this last segment was just beautiful, Carrie, Susan and Elaine! It has been great getting to read all these wonderful authors! Great job, ladies. Thank you. And Happy, Healty New Year to all! Thanks, Lisa! We have a couple of more sections to go, although we originally were to end at Christmas. Hope your Christmas was wonderful! So happy to read this final selection! We have just returned home from our youngest daughter's and waited a day to miss the ice and snow on the roads. Thank you, each one of you, for this wonderful story. How beautifully they melded together! I loved the #8 serial. You girls did a great job. Can't wait for #9. Going to hate for it to end. It has been wonderful since the Tea Party. Love this site and you girls! Running late reading this one since my brother from NY has been here for a visit. We hardly ever get to see each other. A wonderful Christmas with my 2 brothers, the only siblings left out of 8. I would love to win Susan's book. Thought was to be through Dec. and Jan.
Well, aren't I the tardy author!! Sorry! I spent the week at my son's home (the one that returned from deployment in October) and was rejoicing in the love of my grandchildren, sons, and DIL. This Christmas story of new beginnings came together well. I pray that everyone had a wonderful Christmas and will be blessed in the New Year.